• Telescoping Handle Comes With Snap-Pin Engagements For Easy Assembly and Storage. 100% American made. High strength reinforced fiberglass handle. Extra thick polypropylene head. Extra wide comfort grip no-slip texture. Heavy duty wear strip increases durability against friction. 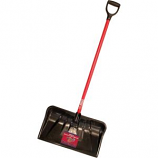 • Heavy Duty, All Purpose Shovel. • Perfect For Everday Maintenance In Farm Facilities. • Helps Clean Up Dry Matter and Bulk Material. • Rugged Strong Poly Grip. • Industrial Quality Polypropylene Blade. Blade Is 26 Inches. Wrap-around brush for clearing mirrors and wiper wells. 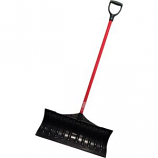 With eva foam complete head to remove snow from small and hard to reach areas. Elliptical lightweight aluminum handle for a better grip. Sturdy scraper made of polycarbonate. .